When you're shopping for a pro gaming keyboard it's tempting to go for one crammed with features, but if you ask an actual pro gamer what they'd choose, they'll probably tell you that they prefer something simple, and that all the extra bells and whistles are strictly for the amateurs. And if you think about pro gaming and its demands, it's easy to see why. You don't want to be lugging an oversized and over-specced hunk of kit around to competitions, especially if you're counting on adding a few trophies to your return baggage. While you can't do much about the size of your gaming rig, or things like your mouse and headset, it's good to save a bit of space with a more compact, streamlined keyboard. And a smaller, more focused keyboard makes sense in a number of other ways, too. For starters, take a look at your numeric keypad; when did you last use it? If you're like most gamers, it's an unused bit of hardware that you'd never miss. Wouldn't it be better to use all that space it takes up for something else? With a smaller keyboard you instantly set yourself in a comfortable, more ergonomically pleasing position, without one of your hands way off to one side. And with all that extra room to play with, you also have more mousing options. If you’re a low-DPI gamer, it means you're never held back by a lack of desk real estate. You can still make those tiny, accurate moves, but you can also let loose with wide, arcing maneuvers without smacking the mouse into the side of the keyboard – or into your drink. And without loads of unnecessary extra features, you also gain reliability. The fewer unwanted extras it has, the less there is to go wrong, so you don't have to worry so much about a vital piece of your gaming armory letting you down at the worst possible moment. All this is why you should take a very close look at the new Logitech G Pro Gaming Keyboard. Designed and built to the exacting specifications of top eSports athletes, it has one simple purpose: to deliver nothing more and nothing less than everything it takes to win. The keyboard’s most noticeable feature is its lack of numeric keypad and delightfully compact design, but there's a lot more to it than that. The Pro Gaming Keyboard uses Logitech's Romer-G mechanical switches, which actuate at just 1.5 millimetres – 25 percent shorter than the standard switch, and translating in a faster response time than your competitors. Romer-G switches are also tested to over 70 million keypresses, so you can be sure they won't die on you when you need them most. As well as responsiveness and durability, the keyboard is made with comfort and portability in mind. It features a three-step angle adjustment so that you can set it up in the position that suits you best, and alongside its compact frame it boasts a six-foot cable so you can be sure that it'll be long enough for you wherever you set up your rig, and it’s removable and braided so that you can unplug it when you’re done, stick it in your luggage and know that you won't have to untangle it when you need it next. And while it's simple, the Pro Gaming Keyboard isn't entirely without personality. 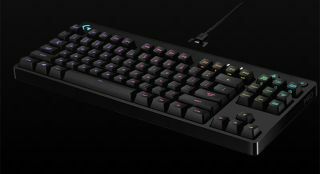 It features programmable per-key RGB lighting with surface-mounted LEDs that improve connection strength and reliability over standard keyswitch-mounted mechanical keyboard backlighting. With Logitech Gaming Software you can have only the keys you need for each game lit, but if you can’t resist a little bit of showing off then you can also use it to light up the room with animated multicolor displays. And even if you're in a competition where custom software is banned, you can still use the keyboard’s lighting. It features the ability to save one lighting preset to onboard memory, so you can be all lit up while your opponents are in the dark. You'll also love its Game Mode, which can be setup to disable any unwanted keys, and that by default switches off the Windows key and removes all possibility of accidentally hitting it and dropping yourself out of the game. The Pro Gaming Keyboard is pleasingly simple in all the right ways with just enough stylistic flourishes and helpful features to make it an essential focal point of your gaming setup. And most importantly, it delivers the performance you need, wherever and whenever you need it. It's available now from Logitech. Order one today, before your opponents do. Designed to exacting specifications for pro gamers to ensure that they can play to win, the Logitech G Pro Gaming Keyboard is available now. Order today to get an instant advantage. To learn more about the Logitech G Pro Gaming Keyboard, visit this page.